There is a multitude of little known western saints within the Orthodox Church. With the official addition of the saints of Spain and Portugal to the liturgical calendar of the Russian Church, it is important to reflect on the importance of the martyrs within this group. What lessons can be learned from their lives? The lives of the saints have so much to offer in terms of pearls of wisdom for living a holy life. Virtually everything we can learn from the saints has a contemporary application. Therefore it is crucial to read the lives of the saints as often as possible. The saints of the Iberian peninsula, modern day Spain and Portugal, are not very well known in the Orthodox Church. Despite this, they are not exceptions, especially those who were martyred under Muslim oppression. Beginning in 711 AD, the Umayyad caliphate invaded Visigothic Iberia. Once in control, the caliphate replaced Orthodox Christianity with Islam as the official religion of the land. Christians and other minorities were forced to accept Islamic superiority, avoid preaching to Muslims, and pay jizya, a tax for being a non-Muslim. Under Islamic law, apostasy and blasphemy were punishable by death. Life as a Christian in Iberia during this period was less than ideal. There was pressure to assimilate to Islamic culture and even convert to Islam. This led to many practicing their Christian faith in secret. The following is a brief survey of the martyrs who lived under the caliphate in Cordoba, al-Andalus (Muslim Iberia). Aurelius was born of a Muslim father and a Christian mother. Aurelius was a Christian by faith, but under Islamic law he was considered a Muslim therefore he practiced his Christianity in secret. Sabigotho (Natalia) was born of Muslim parents, however, after the death of her father, her mother remarried a secret Christian. Her stepfather’s influence caused her mother to adopt Christianity. This in turn eventually led to Sabigothos conversion. When she married Aurelius the two practiced their Christian faith secretly in fear of the Muslim authorities. George was a monk from Palestine. He was sent by his abbot to request donations from the monasteries in North Africa. Upon seeing their oppression, he decided to venture into Iberia, however he was shocked by the oppression of Christians there as well. An abbess in Tabanos directed him to seek out Sabigotho. Eventually, the public persecution of Christians inspired Aurelius and Sabigotho to publicly proclaim Christ. They visited persecuted Christians in prison. Sabigotho had a vision of the two martyrs, Flora and Maria, during which they told Sabigotho that she would meet her martyrdom when a foreign monk arrived. When Sabigotho met George, she was convinced her time was near. Sabigotho was arrested first for apostasy and Aurelius was arrested soon after. George would have been let free as he could not be charged with apostasy, but upon the arrest of Aurelius, he insulted Islam and was arrested for blasphemy. The three achieved the crown of martyrdom on July 27, 852. Felix was a relative of Aurelius who converted to Islam, but returned to Christianity in secret, as this was illegal. Liliosa was the wife of Felix, who practiced her Christian faith in secret. Inspired by Aurelius, Felix decided he no longer wanted to be a secret Christian. The couple began to visit persecuted Christians in prison along with Aurelius and Sabigotho. Liliosa was arrested for apostasy along with Sabigotho. Felix was arrested soon after. The couple were martyred with their relatives and the monk George on July 27, 852. Eulogius was a well respected priest of this era. He was educated at the monastery of St. Zoilus and eventually became the head of the ecclesiastical school in Cordoba. Eulogius encouraged the Christian community to zealously proclaim Christ despite the dangers. He was visited by Aurelius and Sabigotho during one of his imprisonments. 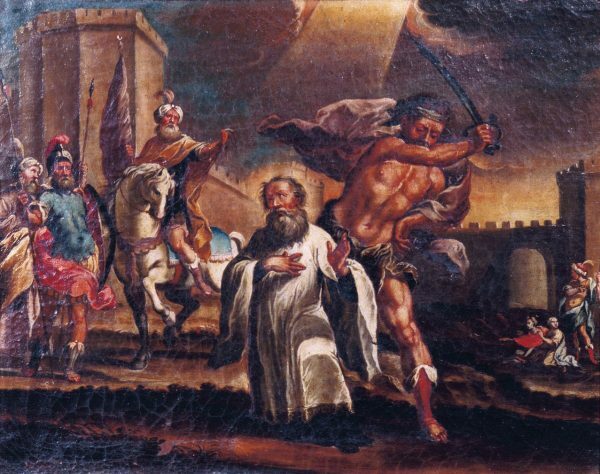 Eulogius was beheaded for aiding a Christian convert on March 11, 859. A nobleman, educated in Arabic, Isaac rose to a high position in the government (secretary of the covenant). He eventually resigned and entered the monastery in Tabanos. After a few years at the monastery, he returned to Cordoba and immediately approached the emir’s palace. He declared to a judge at the palace that the “prophet” of Islam was in hell. On June 3, 851 Isaac was beheaded for blasphemy and his body was hung so that the public would see his fate. Because the culture of the time made it so difficult to be a Christian, many fell away from the faith. Eulogius encouraged martyrdom while local church hierarchy discouraged it. Even some of the clergy desired to assimilate into the Islamic culture. The nominal Christians either converted or ceased to practice. The Iberian martyrs teach us that regardless of the societal pressures or what seems popular we must always follow the example of the Lord. These saints did not hesitate to give up social prestige, wealth, or even their lives. The Christian faith is not one that can be compromised with the spirit of the age. There is now and will continue to be a great deal of pressure on the Church to become secularized. Let us follow the example of the martyrs of Cordoba and be zealous in our faith in Jesus Christ. Holy martyrs of Cordoba pray to God for us! Kenneth B. Wolf, Christian Martyrs in Muslim Spain (New York: Cambridge University Press, 1988), 28.